Is the Baptism in the Holy Spirit for today? "When I returned from the conference in New Mexico, Ida Mae met me at the door, and she was grinning. Before I could get in the door she queried, 'Guess what happened to me while you were gone?' In one burst of speech she said, "I received the baptism in the Holy Spirit, and I speak in tongues!" "Now I was really shaken. This baptism in the Holy Spirit must be a reality, but I could not accept even the testimony of my wife as final authority. I told her that I had to find it in the Bible. "For three weeks I poured over the Scriptures and waited before God in prayer. I was determined to find the answers directly from God and in the Bible. Didn't I already have the Holy Spirit by being born of the Spirit? Was this baptism in the Holy Spirit for today? What was the purpose of this baptism? What were the qualifications for it? Were tongues a part of this experience? Did tongues have any useful purpose? "Then, Frank Hammond met the Holy Spirit as baptizer... "Here I stood, in the middle of a conference, praying in tongues, and there was no fear or embarrassment. I prayed in a very definite tongue; then there was a smooth transition and a different tongue began to come forth, and then yet another distinct language came forth. "The report of my baptism in the Holy Spirit traveled quickly throughout the convention, and the next morning I was asked to give my testimony. A few months later that testimony was published in Voice, the official magazine of the Full Gospel Businessmen's Fellowship International. My experience was far from secret." 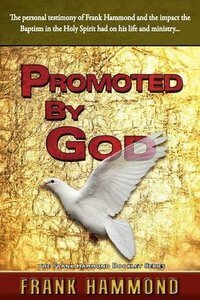 About "Promoted By God: Frank Hammond's Testimony of How the Baptism in the Holy Spirit Ignited His Ministry"